Here are some tips that you can use while painting the interior and exterior of your house. A well-maintained and beautifully painted home will sing praises of its owner. And it will definitely help you when you are in the real estate market to sell your home. You must get your home painted at regular intervals so it will look well-cared for. The longevity of your home will depend on how often you get the exteriors painted. So how do you decide it is time to get your home painted? Normally, when people notice signs of the paint peeling or chipping in their homes, they hire someone to fix the problems and their house repainted. Often people would put off painting their homes either because they don’t have the time to paint it or because they think of doing it themselves. But then protecting your home is your duty and painting it at regular intervals will only add to its life. When you get a painting contractor to paint the walls at regular intervals, your house will have a better chance of lasting through the ravages of different climates. Even if you don’t have the time to do the whole house, you must get the exterior part painted. It will give your home the quick facelift that it deserves. You are going to be very proud of the way your home looks when you conduct lawn parties this summer. Painting the exterior of your home is actually a painstaking and time-consuming job and that is why it is important that you get it done at regular intervals. The painting workers will first scrap and sand all traces of the old paint before they start the actual paint job. This will keep the walls perfect and smooth for the new paint. Depending upon the vastness of the house, the contractor will need only a few days or sometimes, even weeks to get the exterior painting done. If you are living in a terraced house then the workers will have to clean all the parapet walls and the terrace before starting with the painting part. Getting the right kind of contractors for the interior of your home is very important. The contractor you hire should produce a worthy job of making your home neat, clean and beautiful. Some people think painting is a DIY (Do It Yourself) job but hiring a professional will definitely add a professional touch. When it comes to painting an entire house, you will be better off by enlisting the services of professionals because it will not only save you money in the end, it will also make your home more impressive than ever. You can leave everything to the professional contractors because they know what is best for your home. Hiring professionals to do the interior of your home will also introduce you to some new kind of painting techniques and concepts. 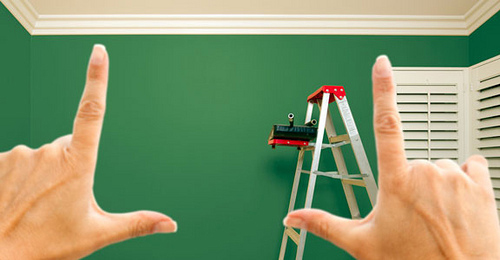 In fact, you can rest assured that the painters will do an immaculate job and make your home look like new. In fact, there are some new and innovative color combinations in market. It is time you revamped the traditional colors and incorporated those.